And bound for Pennsylvania, I left the state of Maine. And the time of term it was six months to serve him faithfully. A voyage to the forest for gold and riches sake. And several other animals too numerous to name. Where rippling waters fierce do rage and cataracts do roar. Ninety-five years ago, in the summer of 1923, Franz Rickaby collected a version of the above song in Bayport, Minnesota (south of Stillwater) from former lumberjack Hank Underwood who called it “The Maine-ite in Pennsylvania.” Underwood’s four verse version (verses 2, 4, 6 and 7 above) likely descended from the New Brunswick song “Morris Ellsworth” which satirizes a greenhorn logger from Prince Edward Island who comes to the Miramichi woods to log. The St. Croix Valley where Underwood was born, had a high concentration of immigrant loggers from the Miramichi region – including Underwood’s parents. Jokes and stories making fun of inexperienced men in the logging camp – especially their fear of animals – were common in the woods. According to folklorist Edward Ives, PEI men were looked down upon in Miramichi. Interestingly, Rickaby reported that “State of Maine” men were often foremen or bosses in Minnesota. Underwood likely learned his version while logging in Pennsylvania where, perhaps, Maine-ites had a different reputation. For a biography of Hank Underwood see the liner notes to my CD Minnesota Lumberjack Songs which also includes an arrangement of this song. 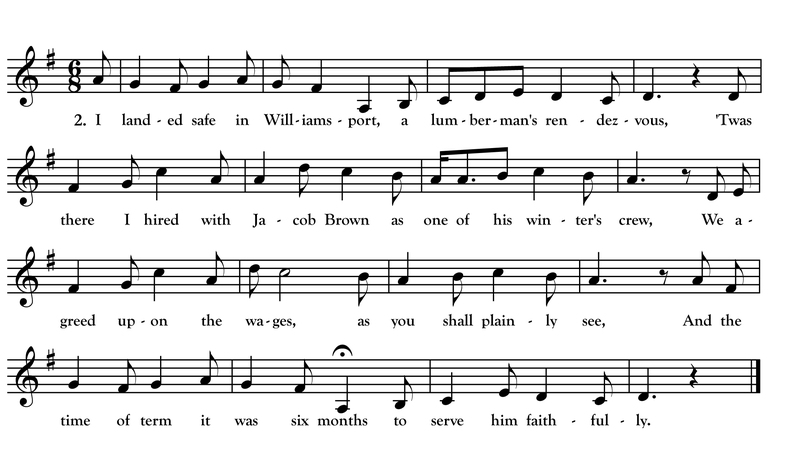 For the version above, I use a melody very close to Underwood’s melody and extend his text with extra verses added in from one of the Miramichi versions and one verse pulled from “Jim Porter’s Shanty Song” also collected by Rickaby.